Relaxation awaits you in this beautiful one level 4 bedroom, 2.5 bath 2550 square foot home fully furnished with everything you will need to enjoy your California vacation. Kick back and relax on the patio furniture and watch the golfers drive by or swim in the sparkling saltwater pebble-tec pool and spa. Lounge with a cool beverage under the umbrella on the swim shelf. For the golfers, Indian Palms offers 27 holes of USGA Championship golf. Perhaps tennis is more your style so come play on one of the 5 (lighted) tennis courts or workout in the lifestyle fitness center. Practice your putting or chipping in one of the practice areas or enjoy eating out at the restaurant/pub. This home is furnished with top of the line furnishings. The Master Suite has a king size bedroom set, separate TV and has a separate door to the pool and spa. The other 3 bedrooms have their own private TV's. Two of the bedrooms have Queen beds and the other bedroom offers two singles. The living room has a sofa, loveseat, and 2 chairs as well as a brand new 50' Plasma TV and blue ray DVD player. 27 holes of golf, tennis, pickle all, bocce ball, and workout facilities a short walk from our front door. Great shopping and restaurants close by. 50' Plasma in living room with regular and blue ray DVD player, 32 inch flat screen in master bedroom, 20 inch flatscreen tv in bedroom 1, 30 inch tv in bedroom 2, 20 inch tv in bedroom 3. The house is very large and open and was clean when we arrived. It's perfect for a group of friends or a family. The backyard on the golf course is private and has a great pool and hottub. The gated community is nice with friendly neighbors. We had a great time with family and young kids. 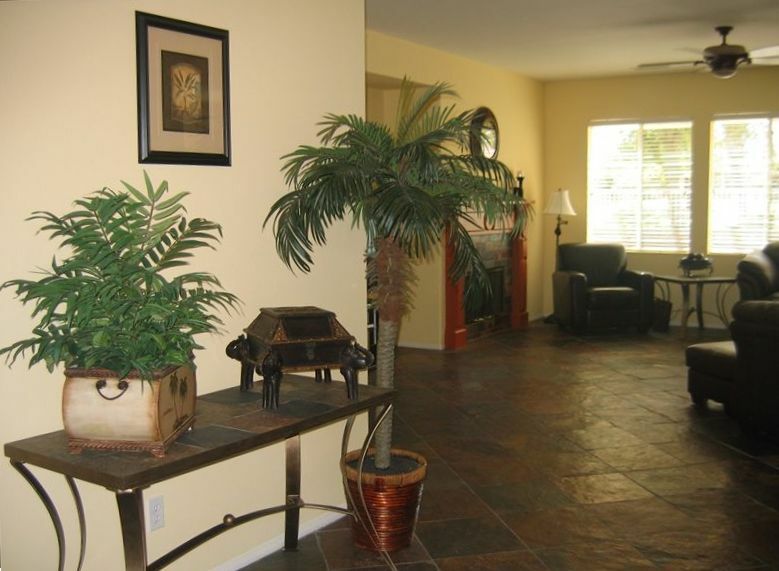 The house is a perfect vacation rental in Indio. If renting here again I would request a walk through with the property manager at the end of my stay. It could have saved me from losing money on my damage deposit because of miscommunication. However, when we did have a problem the owner was very reasonable and we were able to agree on the amount to be returned. She was also easy to contact and helpful with any questions during our stay. We had a wonderful experience staying here. The house is spacious and offers an open floor plan perfect for entertaining a group or family. Everything within the house was labeled and easy to follow. We thoroughly enjoyed grilling outside and hanging out by the pool during the day or the hot tub at night. The neighborhood is very secure and the location is great if you are planning on attending Coachella or Stage Coach. I would highly recommend this house to anyone planning on coming to Indio who is looking for a relaxing, turnkey lodging experience. Booked the house for Stagecoach and arrived to a beautiful exterior in a great neighborhood close to the venue. Enter the house and see that the floors have not been cleaned, dirty dishes all over kitchen, food stuck to the counters, a pile of towels and sheets in the laundry room that stood 5 ft high and the garage reeked of dead carcass. The place had not been cleaned from the guests before. We called the owner and explained the situation to her and she said that she would contact the property manager and have someone come clean it immediately. The owner seemed very sympathetic and apologized. She gave us the option to clean and she would give us $200 back from what we already paid her. We stated that $200 back was not worth the time and effort for us to clean. We informed her that we were going to leave and head to the store so that we would be out of the house so it could be cleaned. She stated that she would call right away. While we were out, the owner called and left a very rude message stating that she wasn’t going to call anyone to clean if we didn’t call her back in a few minutes after we had just told her we were leaving and the key was in the lock box. When we returned her call, she was again very rude over the phone. In the end, the house was never cleaned by a company and we had to pick up so that it was livable for the weekend. We luckily met the neighbor across the street (who also rents their house) and they gave us laundry detergent (because there was none at the house) so that we could wash some of the sheets to put on the beds. We also never got the $200 back that she had promised. The house is nice, but not worth renting with the current property manager/owner combination. This house is fantastic! As are the owners! I've been staying at this house for the last three years and look forward to returning every year. This house is perfect for a group. The common areas - living room, dining room and kitchen are all very spacious with plenty of room to hang out together. The backyard feels like a little oasis in the desert - pool, hot tub, BBQ, golf course. The pool is lovely for lounging during the day and you can't beat the hot tub at night. If I've ever had any issues/questions, the owners have always been very responsive and attentive. I'd recommend this house to anyone looking for a desert retreat - for the music festivals, golf or just relaxing. ** Worth noting that my group of friends and I were at the house the weekend before JB (negative review below) and I can assure you, there were not dirty dishes all over the kitchen or food stuck on the counters. We cleaned thoroughly before leaving. His experience is so inconsistent with anything that I have ever experienced with the owners/property in any of the years that I have stayed here. You can't beat this house, with it's amazing pool and hot tub at your disposal. Very spacious. All the rooms are comfy - from bedrooms to living rooms. A gorgeous view of the mountains in the back, while you're relaxing by or in the pool/hot tub. Gate staff to get in were friendly as well. This was our 7th Coachella in a row and 2nd at this house. We can't wait to stay here for a third time for our 8th (!) Coachella next year. This house was everything and more the owner had stated. The pictures do not do it justice. We were very pleasantly surprised at how large and open the concept was. The place is immaculate and extremely well maintained. Also the owner was always available and helpful with any questions. I would love to come back and would not hesitate to recommend this vacation home.